KISSIMMEE, Fla. (Oct. 26, 2016) - Going head-to-head with our 'coqui' is not for the faint of heart. That's right. It's official. 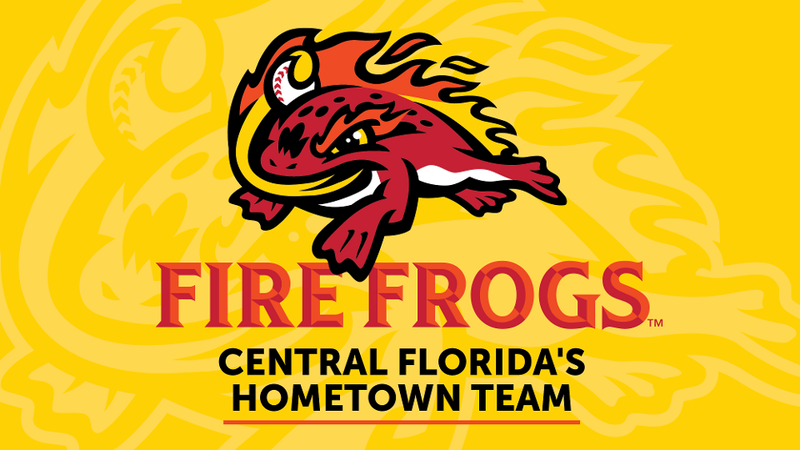 Central Florida's new Minor League Baseball team today announced it's new name - the Florida Fire Frogs. The name is a result of hundreds of submissions over the summer during the team's "Name the Team" contest. "We're excited to unveil the team's new name, which we feel represents the geographic diversity of our fan base, has a hometown feel and speaks to the fun, vibrant experience our fans will enjoy at games," said Team President Joe Harrington. "We're working on creating a fun and entertaining promotional schedule for our inaugural season at Osceola County Stadium next year, and we continue to be overwhelmed by the positive response from the community and our fans." A glowing red frog, ablaze with flames, is the centerpiece of the team's new identity, surrounded with traditional lettering to make up the team's primary mark. The team's colors are fire red, navel orange, and golden sun, and fans will find a variety of alternative logos on the team's website and merchandise store, including the horned "Bull Frog," a fun nod to the community's rodeo heritage. The team also announced that Karah Morrison and Steven Strickland were the winners of the team's Name the Team contest over the summer and each won two season tickets for the 2017 season. News of the team's new name is just the latest in a series of announcements. Just last month, the team announced a four-year affiliation agreement with the Atlanta Braves. The Player Development Contract will remain in effect through the 2020 season. Additionally, the team released its 2017 Florida State League (FSL) schedule and announced the sale of season seat memberships. The team's inaugural season at Osceola County Stadium will start April 6 against the Daytona Tortugas. Membership packages include full season (70 games), half season (35 games), partial (15 games) and mini (7 games). Full season packages start at $350 and are available by calling 321-697-3156. The team's offices and merchandise store are open 9 a.m. to 5 p.m. Monday through Friday and 10 a.m. to 2 p.m. Saturday. For more information, visit www.FloridaFireFrogs.com.